There are probably a lot of glass jars in your life, especially if you are an ecologically-conscious person. 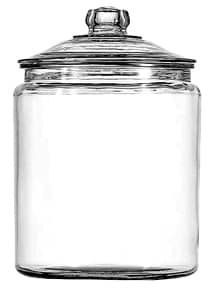 Glass is one of the safest, most ecologically containers. It’s responsible for common food packaging materials, and many items come in it. This leaves people with piles of glass jars that they don’t have much use for. You could recycle them, but what fun would that be? Peel off the part of the label that comes off easily and put your glass jars through the dishwasher, if you have one. Otherwise, soak in hot water and dish soap overnight. Once you are done, the parts of the label that is going to come off should be off. If you want more of it to come off, try non-acetone nail polish remover. However, in many cases it isn’t necessary to get the entire label off. Wash or put the lid through the dishwasher as well, unless you are sure you don’t want it. Although lids may not make air-tight seals on their jars again, many of them continue to be useful. Many crafters throw away the lids, assuming that they cannot be reused, but this is not the case. Some seal better than others, so test out a few if you are looking for one with good leak-proofing. This is one of the most obvious methods of repurposing jars, but they really do make great storage containers. Little ones like baby food jars are perfect for keeping buttons or snaps for sewing, nails or screws for home repair projects, and leftover sauces or other condiments. Slightly larger ones make good places for colored pencils to find a home, an ideal way to store the leftovers from one person’s dinner and more. Large jars can be used for keeping baking staples like sugar or flour, as well as storing cereals so that they stay fresh longer than in the box. You can store dog biscuits, cookies, crackers and other snack food in larger jars that seal fairly tightly. Some big jars make good food storage containers, while others don’t. Experimenting is the name of the game. Jars are simple items that can be very aesthetically pleasing in the right circumstances. You’ve probably never thought of making a picture frame with a jar. Jar vases are common, but some are more functional than attractive. However, that can be changed with the proper application of some simple fabric and bows. Decorating a jar can be a great project with kids who are old enough to handle glass safely, as well.